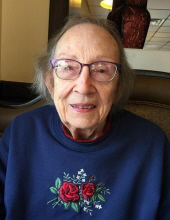 Patsy Joann Hodgson (nee Armstrong) age 82 of Waukesha, Wisconsin (formerly of Neosho) passed away Sunday, August 26, 2018 at Linden Grove Nursing Home in Waukesha. Patsy was born November 21, 1935 in Texas to Opal Fontaine and Otho Armstrong. Patsy was married 21 years to James W. Panawash. They had 4 children while they were in the United States Air Force. In 1978 Patsy married Clifford Hodgson and they were together until his death. She was nicknamed “Pastey” by her co-workers at Horicon State Bank in Neosho, WI. She was a longtime member of St. Olaf’s Lutheran Church in Rubicon, WI. Patsy is survived by her loving children, Debra (Stan) Galbraith of Richfield, Gregory Panawash of Waukesha, Brenda (Mark)Panawash-Bielinski of Pewaukee, and Jennifer (Tim) Rouse of Waukesha; cherished grandchildren, Heather (Dean), Justin (Linnea), Casimir, Abby (Bill), Niki (Anne), Taylor (Isabella), Griffin, and Andrea (Alex); and 11 cherished great-grandchildren. She is further survived by brothers-in-law; nieces, nephews, other dear relatives and friends. She is preceded in death by her parents; her beloved husband, Clifford; and her former husband of 21 years, James W. Panawash. Funeral Services for Patsy will be held Sunday, September 9, 2018 at 2:00p.m. at the Shimon Funeral Home (824 Union Street Hartford, WI 53027). Family will greet relatives and friends at the funeral home on Sunday from 1:00-2:00p.m. Interment in Forest Home Cemetery, Richfield, WI. Patsy’s children would like to share their sincere gratitude to the wonderful nursing staff of Horizon Home and Hospice who took great care of their mother. If you wish to donate in Patsy’s name, contributions to Horizon Home Care & Hospice (P.O. Box 88828, Milwaukee, WI 53288-0828) are appreciated. To send flowers or a remembrance gift to the family of Patsy Joann Hodgson, please visit our Tribute Store. "Email Address" would like to share the life celebration of Patsy Joann Hodgson. Click on the "link" to go to share a favorite memory or leave a condolence message for the family.